Successfully Added Uhans S3 Android Smartphone - Android 6.0, Dual-IMEI, 6-Inch HD Display, 3G, Bluetooth, Google Play, Quad-Core CPU, 3100mAh to your Shopping Cart. Meet the Uhans S3, a cheap Android phone that lets you enjoy the latest software features at an affordable price. Packing a Quad-Core processor that has been clocked at 1.3GHz, this Android smartphone is capable of tackling all the basic Android Apps out there. Whether you like to play games, watch movies, or simply make a phone call – this cell phone is sure to meet your demands. It comes with 2 IMEI numbers thanks to which it brings along great connectivity. By allowing you to be reachable on two phone numbers at the same time – the Uhans S3 is perfect for separating work and private life. If you are looking for a cheap backup phone or simply for an affordable device for your child or senior family member – this Android phone certainly is a phone to consider. Android 6.0 is guaranteed to bring forth a smooth user experience. By letting you enjoy the latest software features and games, this smartphone is sure to impress. Simply head out to the Play Store where you’ll find tons of free media and games. Thanks to its stunning 6.0-Inch display, you’ll be able to undergo a crisp visual experience at any given moment. 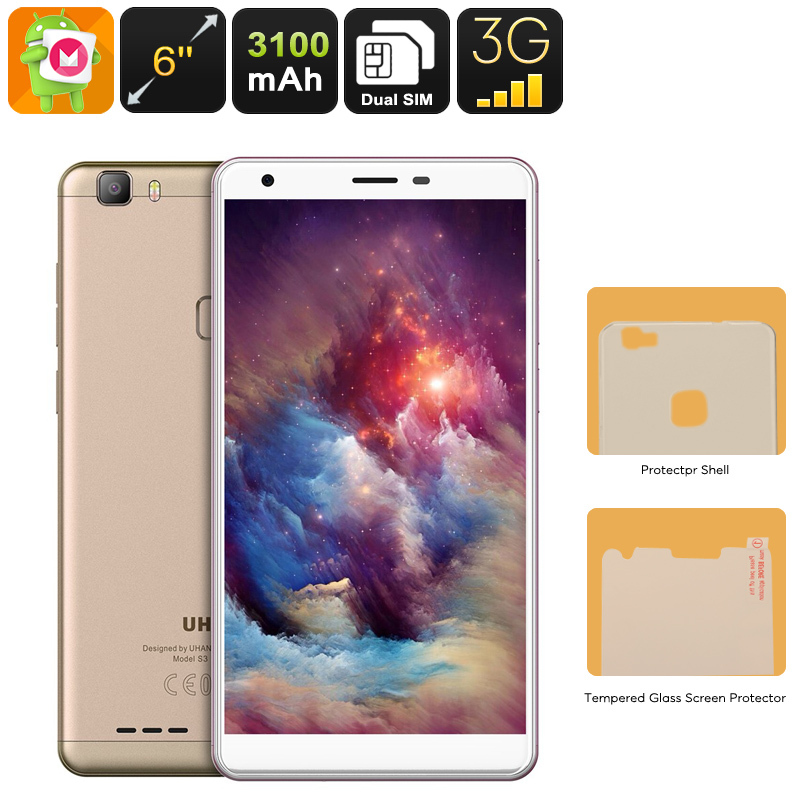 With 16GB internal storage and 64GB SD card support, it is guaranteed that your cell phone packs enough memory for you to store all your files and media. It furthermore comes with an epic 3100mAh battery that brings along a whopping 8 hours of continuous usage time. From now on, you’ll be able to leave your home with confidence as worrying about battery life will be an issue of the past. In order to increase your connectivity even further, this cheap Android phone supports both WiFi and 3G. The latter lets you enjoy fast mobile data speeds no matter where you’re at. Whether you’re at home, in the office, or enjoying a day out in the park – with the Uhans S3 you’ll always stay connected. With its 8MP rear camera, it furthermore lets you snap beautiful pictures and 1080p Full-HD video. Therefore, you can be assured that from now on not a single special moment in life will pass by uncaptured. This smartphone comes with a 12 months warranty, brought to you by the leader in electronic devices as well as wholesale electronic gadgets..